#GivingTuesday is just around the corner and most of us have big plans to engage our community. Executive Directors, CEOs, Development Directors and Development Committees spent time planning the #GivingTuesday strategies and now you are executing those key strategies. 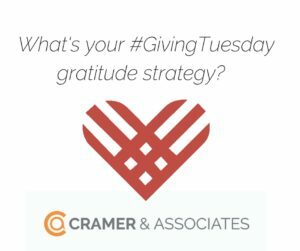 With #GivingTuesday only a week away, this week is the time to check your plan to make sure that it also includes gratitude strategies. How are you giving thanks for the time, donations and goods that were given to your organization on this global day of giving back? 1. Personalize Thank You Notes or Postcards: Receiving a personalized note or postcard from your board members, CEO, or executive director means a lot to those who are supporting your organization. You might reserve the date on your CEO / executive director’s calendar to help write thank you notes on #GivingTuesday or the very next day. You can reserve the date on the calendar and call it #GivingTuesday Gratitude Time! If you don’t have unique postcards or notes for #GivingTuesday, take a few minutes and get those designed and have them printed. 2. Personal Gratitude Phone Calls: Hearing from the executive director, CEO, a Board member or the development director after #GivingTuesday means a lot to the individuals and families who have supported your organization. To work ahead, write a thank you call script now and set up the query in your database to export all the #GivingTuesday donors with addresses and phone numbers. On November 29th (the day after #GivingTuesday), you will be ready to run the report and split the call list between your CEO/executive director and your Board members. By engaging the Board in the thank you phone calls, they will hear beautiful stories about why donors are supporting your organization. 3. A Staff Picture: Before #GivingTuesday, gather your staff for a picture and make a thank you poster. You can take a few pictures – funny or casual. If you are raising money for a special project or place on your campus or at your location, have the staff photo taken in this area. The pictures can be used on social media. Don’t forget to be creative and add your logo on the picture as the picture will most likely be shared spreading the word about your organization. 4. Special E-communications: Sharing thanks for the gifts, time and goods shared with a special e-communications allows your organization to celebrate together. By communicating a thank you through your e-communications system also encourages the excitement of the individuals who may not have participated this year to think about participating next year, or maybe before the end of the year. 5. Thank You Press Release: Sending out a press release to your local TV affiliates and newspapers after #GivingTuesday is a good way to share your organization’s giving and mission stories and gain some additional press coverage. Whatever the gift size and the number of hours given on #GivingTuesday, add a special touch of thank you. Giving thanks and expressing gratitude is just as important as planning how to get everyone involved on this global day of giving back.